Detailed maps of future tsunami flooding (inundation) are needed for delineation of evacuation routes and long-term planning in vulnerable coastal communities. Computer models are used to develop the inundation maps used for coastal community planning. Tragic loss of life and extensive property damage can be caused in coastal communities by tsunamis generated by undersea earthquakes and landslides. Tsunamis in geologically similar areas such as Papua New Guinea, Japan, Nicaragua, and other Pacific Rim countries, and the disastrous December 26, 2004 Sumatra tsunami, have been tragic reminders of the devastation that can occur in coastal areas lacking adequate preparation for these infrequent but powerful events. 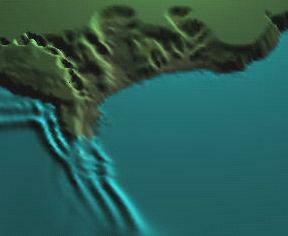 Computer models need quality bathymetric and topographic data sets to develop inundation maps. Inundation maps require maintenance and upgrades as better data becomes available and coastal changes occur. A suite of numerical simulation codes known as the MOST (Method of Splitting Tsunami) model (Reference PDF file) is capable of simulating three processes of tsunami evolution: earthquake, transoceanic propagation, and inundation of dry land. Shown in the figure (above, left) is inundation of the Aonae peninsula during the July 12, 1993 Hokkaido-Nansei-Oki (Japan) tsunami computed with the MOST model.